Hiroshige III's Famous Places in Tokyo - Attractive design from a series depicting famous places in Tokyo, published over several years starting in 1868. 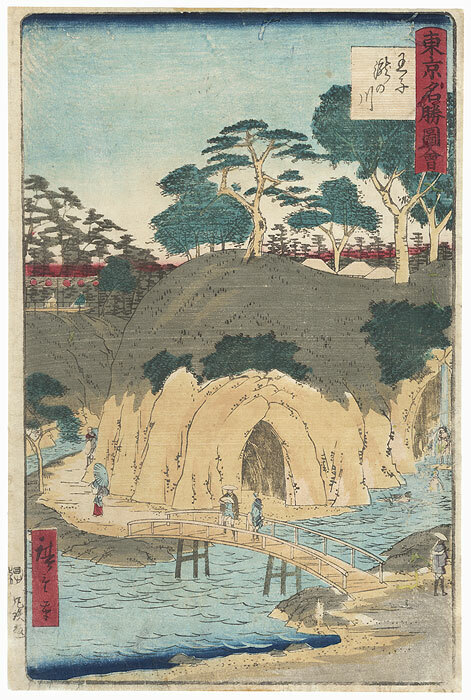 Hiroshige III includes traditional locations and activities, as well as modern Meiji sights, such as Western style buildings and transportation. These lively scenes are filled with wonderful detail, carefully rendered with vibrant color and soft shading. The Boston Museum of Fine Arts has many images from this series in its collection. A great look at the rapid changes taking place in Tokyo during the Meiji era. Waterfall River at Oji, 1869 - Wonderful view of the Takinogawa or Waterfall River as it passes through Oji. The area was famous for its beautiful maple trees and fall foliage. 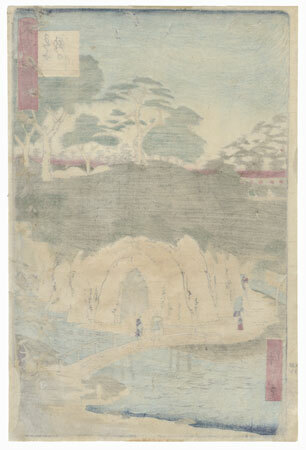 At right, a pilgrim stands under a rushing waterfall doing penance as two other men swim in the water nearby. 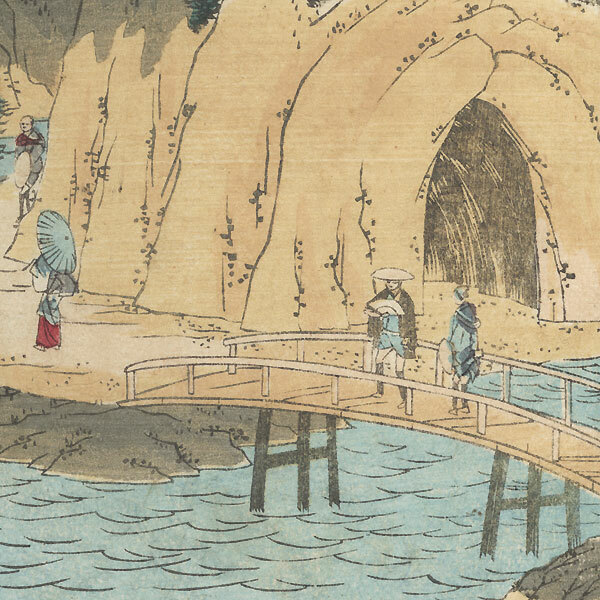 Pedestrians stroll along the shore, two men passing over the arched wooden bridge in the center. Other visitors take a break at one of the tea stands atop the hill, relaxing on benches under a string of red paper lanterns. An attractive design, nicely detailed. The Boston Museum of Fine Arts has this image in its collection. Condition - This print with excellent detail as shown. A few wormholes, slight thinning at edge, repaired. Creasing, slight soiling, slight rubbing at edges. Please see photos for details.